Flowermill is a wholesale gift stationery company. We design and print beautiful greeting cards, gift tags, wrapping paper, gift bags, wine tags, journals and more for retailers across South Africa, Namibia and further afield. We have a bright and happy range of products that are all on-trend and available with or without gorgeous wooden point-of-sale stands. 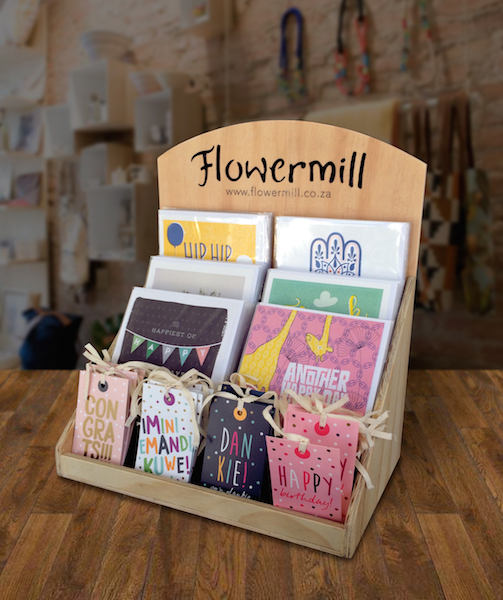 Flowermill has become a well-loved brand over the years. We just love knowing that our products spread joy all around the world, making gift-giving even more awesome for everyone involved. In fact, we think there is something special about every one of our products! All our products are made with a whole lot of love in Cape Town, South Africa, where we are continually inspired by the beauty around us. Most of our cards are printed on recycled paper and we make ethical and conscious choices wherever we can. Subscribe to receive our emailed catalogues. If you have a shop and would like to stock Flowermill products, please enter your email address below. We'll keep you updated and send you our priced catalogue whenever we have new items to share with you.